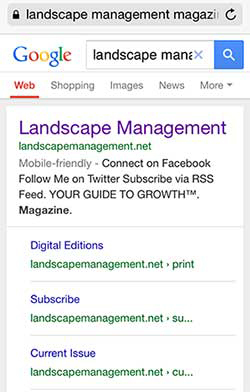 Google’s changing the way people find your business—here’s what it means for your landscape or lawn care company and how to test your site for mobile-friendliness. Customers find businesses online in a variety of ways: Typing a domain directly into the URL bar after seeing it in an ad or on a truck or clicking through from social media links. But when it comes to your online existence, nothing compares to Google Search. With 83 percent of the search traffic, it’s little wonder that searching and “Googling” are used synonymously. The most significant Google Search change in years—dubbed “Mobile-geddon”—is coming tomorrow, and it could be a game-changer for your business. As of April 21 Google will be shuffling the order in which websites appear in mobile search results, favoring those websites it deems “mobile-friendly,” or those that fit nicely on a small smartphone screen without requiring a bunch of pinching-and-pulling to view. Why? More than two-thirds of Americans now own smartphones and it’s estimated that more than half of online searches come from mobile devices. Sites that pass the test will rank higher and have more impressions and more clicks from Google Search. Consider: The first 10 results (the first page, basically) get 90 percent of the clicks. That’s huge when you consider 3.5 billion searches are conducted on Google each day worldwide. Here are three tests to run now to find out how you’re doing on mobile. 1. Get on your smartphone, head to Google and search for your company. In the browser on the results page, does it say “Mobile-friendly” underneath the name of your website? This test is the first indicator of how your site is doing. This isn’t, however, the final word. If your site uses doorway pages—one or two pages that are mobile friendly while the rest are not—this gaming of the system isn’t going to cut it in the new Google landscape. Your whole website needs to work on a smartphone, not just the homepage or a single landing page. 2. 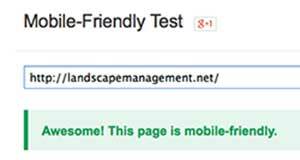 Run Google’s Mobile-Friendly test. If you pass, you get an “Awesome!” Nice feeling, right? And if you don’t pass, you’ll get to see how your site looks on a smartphone, a list of resources on your site to start fixing and some tools to get started on becoming mobile-friendly. 3. Dig into your Google Webmaster Tools. If you haven’t already signed up for Google Analytics, you should do that first—it’s a good step anyway to learn more about your website’s visitors and what’s working on your site. Then in your webmaster tools, go into “Other Resources” and then “Page Speed Insights.” In this more advanced version of the mobile-friendly test, you’ll get a grade on your site’s speed and overall mobile user experience, plus a detailed report of what you need to do to improve. If you passed all three tests, congrats! If not, take this as the sign it’s time to invest in catering your site to mobile visitors. Whether you agree with Google’s decision or not, you have to play by their rules to have a high rank. The good news: Google algorithms take time to roll out and this first iteration affects only search on mobile—not desktop search, Google News or images. Those will typically roll out in the weeks and months that follow. Making your site mobile friendly is a big job, but it’s ultimately a valuable customer service and marketing tool that can generate new business and meet your clients where they are—on their phones. Chambers is the digital operations manager for LM’s parent company, North Coast Media. She has a master’s degree in interactive publishing from Northwestern University’s Medill School of Journalism and a bachelor’s degree in marketing from Duquesne University.